How do you recognize greatness in sports? Usually, we recognize it when an athlete or team accomplishes feats that seem next to impossible. During the 2008 Beijing Olympics, U.S. swimmer Michael Phelps accomplished greatness when he went 8-for-8 with 8 gold medals, a feat never accomplished in Olympic swimming history. While Phelps didn't need this year's Olympic Games to solidify his greatness, by taking the chance at an older age to fail, he made matching his legacy in the pool even more unreachable in the near future -- if ever. Phelps finished the London Games as the greatest Olympian of all-time. But early on, it looked like that might not be the case, after fellow U.S. swimmer Ryan Lochte dominated Phelps in one of his signature events, the 400-meter individual medley. However, the champion inside Phelps once again came out, as he finished the games winning more medals than any other Olympian -- 4 gold and 2 silver. 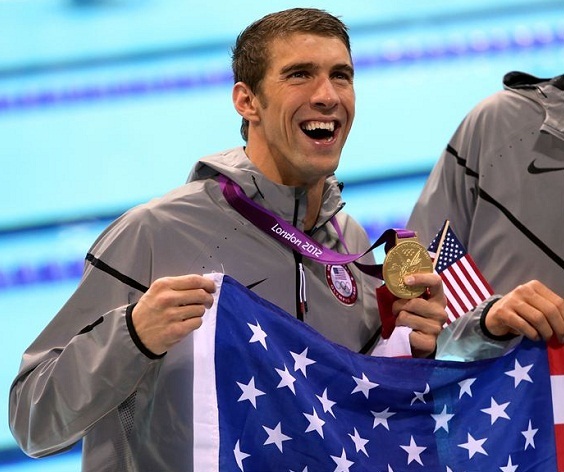 Phelps regained his Beijing form by blistering the competition in the remaining events. He even won his always closest race, the 100-meter butterfly, fairly easily. Phelps has proclaimed that London is the last time we will ever see him glide through the water like a dolphin. If this is true, it is very sad, as the odds we will ever see another Michael Phelps are highly unlikely. When you watch sports, you can always tell when you're witnessing greatness. Phelps makes SWIMMING must-see TV, and that in itself is a tell-tale sign of just how one of a kind he is as an Olympic athlete. The 2016 Games just won't be the same without Phelps, as surely no male American swimmer will be able to win almost every race he enters as Phelps did in Beijing. Therefore, now that he is finished, we must begin predicting how large of an impact his dominance in the pool will have on the popularity of swimming as a sport amongst American youth in the future. Phelps has already started swimming schools around his Baltimore home. However, the problem with Olympic athletes is that shortly after the flame is extinguished, even the most dominant ones fall off the national radar. However, I believe Phelps may be a different case because of these Olympic Games. By setting the standard by which all Olympic athletes will be judged in winning a total of 22 medals, he has graduated to the likes of Michael Jordan and Joe Montana in the upper echelon of athletic greatness. Could Phelps shock us all and compete in Rio in 2016, or do you believe he is truly done? If he is officially calling it quits, I believe we all owe him a big thanks. Phelps showed us that through hard work, anything is possible. And that even with initial failure, you can find it within yourself to muster up one last bit of greatness -- which ended the most magnificent career in the history of the Olympic Games. Farewell Michael. You will be missed. he's the most decorated olympian, but he's not the greatest. ^^^ 22 medals over the course of THREE SEPERATE OLYMPICS. Yes, he's the greatest EVER.